Division of Beloit, Wis., has received an order for four diesel engines that will supply all of the electrical power for a huge offshore drilling rig;—the Ocean Ranger. The engines will be built for Ocean Drilling and Exploration Co. of New Orleans, La., a major company in- volved in drilling for oil and gas around the world. The four Fairbanks Morse Model 38TD8-^ opposed piston engines will each be 12 cylin- ders, 3,600 horsepower and turbocharged. A unique feature will be a double rpm rating de- pending on the service required. At .720 rpm the engines will generate alternating current for drilling, work power and personnel accom- modations. At 900 rpm, direct current will be generated which will be used for propelling the giant craft. Each of the four engines will be skid mount- ed and direct connected with electric genera- tors. Two of these skids will be 35 feet long to accommodate an engine, one AC generator and two DC generators. The other two engines will be mounted with two DC generators alone. The AC equipment will be rated at 1,400 kw, the DC machines at 600 kw. The Ranger is a semisubmersible super rig, 391 feet long by 262 feet wide. Twin lower hulls will house electric motors which will pro- duce a total of 14,000 horsepower to propel the rig 'by a twin Kort nozzle system. It will have the capability to drill from a floating position in water depths up to 3,000 feet. More than 40 Fairbanks Morse diesel engines are supplying power for ODECO drilling rigs around the world. The Ocean Ranger has been designed to operate in any drilling environment worldwide. It has the capability of operating for extended periods without the need for be- ing tended by supply boats because of enlarged material storage capacities. The Ranger is 39] feet long by 262 feet wide and can drill in a floating position in water depths tip to 3,000 feet. The mooring system will consist of twelve 45,000-pound anchors with a combination 3}£- inch chain and cable with a breaking strength of nearly a million and a quarter pounds. There will be living quarters for 100 men. A heliport on deck will support a helicopter for transport- ing personnel and equipment. The rig is sched- uled for completion in the spring of 1976. Powered by a pair of GM Detroit Diesel engines, the Sun- shine State has a free speed in excess of 11 knots. Lakes Dredge & Dock Company by the build- er, N.E. Insley, Inc. of Crisfie'ld, Md. Coast. The Sunshine State's ample 'beam and deep V hull configuration will provide increased stability in rough seas. The hull, framed on 18-inch centers, is heavi- ly built using J^-inch plate for the sheer strake and 5/16-inch for sides and bottom. There are four transverse bulkheads and four fuel tanks with a total capacity of 2,800 gallons. The Sunshine State is equipped with hy- draulic steering, two 3.5-kw diesel generators, air starting for main engines, keel cooling, ra- dar, radiotelephone, monitor receiver, depth finder, and both hand and electric bilge pumps. The tugs forecastle offers full-day boat ac- commodations and seats six men. The pilot- house is large with good visibility. A full- length bunk/seat provides additional seating required during crew deployment. Inc., P.O. Box II, Crisfield, Md, 21817. Remote control of propulsion, power and auxiliaries for instant response — faster, safer, more efficient towing. 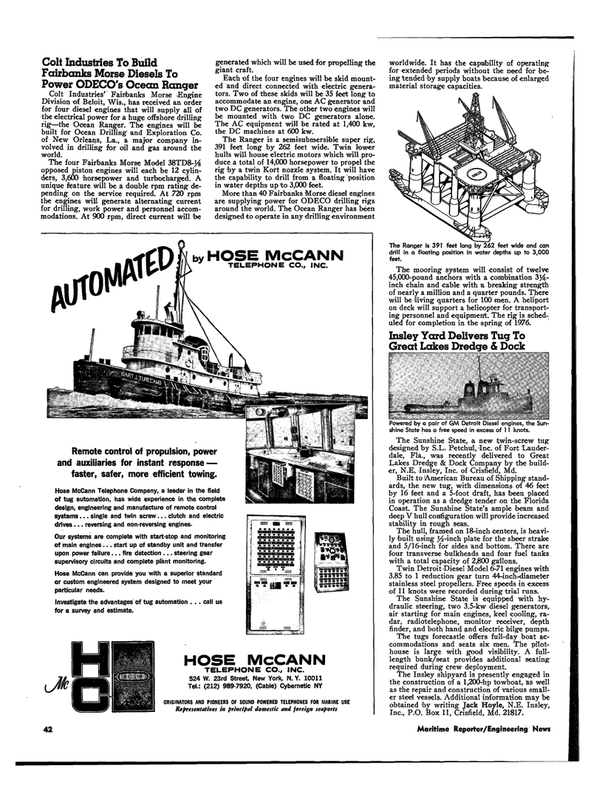 Hose McCann Telephone Company, a leader in the field of tug automation, has wide experience in the complete design, engineering and manufacture of remote control systems... single and twin screw... clutch and electric drives... reversing and non-reversing engines. Our systems are complete with start-stop and monitoring of main engines... start up of standby unit and transfer upon power failure... fire detection ... steering gear supervisory circuits and complete plant monitoring. Hose McCann can provide you with a superior standard or custom engineered system designed to meet your particular needs.